Great memories are made at Fiddlehead Farm Camp! For your pony-crazy child -welcome to heaven! Build your child’s life skills while boosting their confidence! Perfect for ages 4 to 8 years! An Introduction to Horsemanship with Lots of Farm Fun Home of STARBUCK the Wonder Pony! There will be no more than eight children per session and helmets will be provided. Camp will meet regardless of the weather as we have many indoor offer barn related activities. 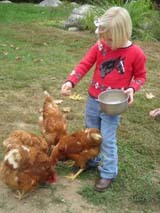 The Fiddlehead Farm Camp is especially designed for children ages 4 to 8. 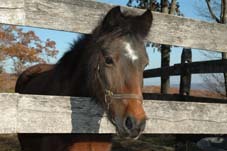 Fiddlehead Farm is also home of Starbuck the Wonder Pony. Fiddlehead Farm Camp is the perfect introduction to farm life and to riding, barn chores, and farm life while encouraging good safety habits, and proper technique when working around animals. During this 2 ½ hour session we will learn to groom, tack up the pony, and go for a ride. During our ride we will focus on balance and steering while riding on the lead line. Following our ride we will break for a farm related story while enjoying a healthy snack. Next we will collect eggs from the coop, feed the animals, plant seeds and pick flowers, herbs and vegetables of the season, and perhaps even give a pony a bubble bath! 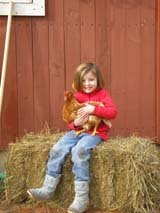 We will also be offering Spring and Fall "mini farm camp" classes for children 3 to 6 years of age. Fiddlehead Farm Camp also offers fabulous pony rides for special events such as birthday parties, family reunions, block parties, and school or church festivals. A pony at your party is the next best thing to having one of your own, and our ponies make every event exciting and memorable. Moms and Dads, you can browse in our Fiddlehead Antiques Barn while your kids have their class. Enjoy perusing through our wonderful selection of antiques, collectibles, furniture, silver, artwork, china, and handmade sterling jewelry - always at great prices! Fiddlehead Farm has it all! Camp will meet Monday to Friday from 10:00 - 12:30. The cost for each week is $225.00. Some scholarship opportunities will be made available and payment plans are welcomed. Call Louisa at 860-653-5279for more information, or to register for the season.